We were asked to provide technical backup and instruction as part of Sally Whittaker's "Britain's Favorite View". If you are quick you might see or hear a fleeting moment of us. 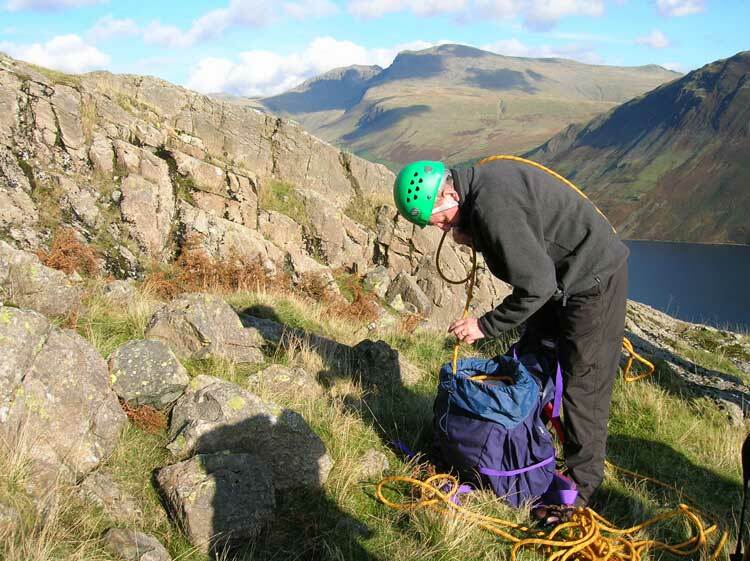 We were all excited as we began to talk about taking Sally to do Napes Needle the 'Birthplace of English Rock Climbing' high on Great Gable (the central hill on Britain's Favorite View). A quick look at the face of Howard Christie of the Wasdale Head Inn told us that might not be what they were after.. "I think they want something a little closer to the road Richard". I think he was remembering the problems of getting Gruff Rhys Jones to the top of Napes Needle, in 'Mountain'? 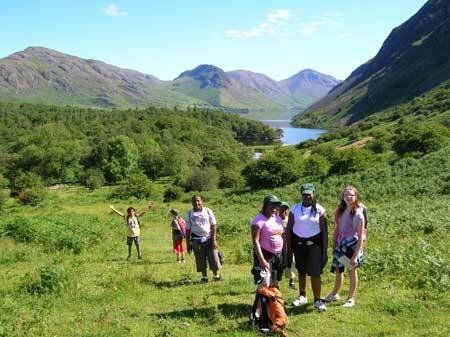 Anyway we found a suitable crag quite close to the road with a good backdrop of Scafell and Scafell Pike. After Howard had done his chat with Sally at the viewpoint with Wasdale "Britain's Favorite View" in the background we headed up the valley. I set up the ropes and Carol helped Sally into a harness, Carol was rather alarmed to have a large grey furry beast appear between her feet, to her relief it was only a microphone. Then the panic really set in as she realised she was actually going to appear in shot with Sally, neither of us had expected this. After a few minutes with Carol Sally set off up the rock face. I was very impressed, she climbed nimbly with poise towards me, stopping only to take in the views for the cameraman, and at one point reverse climbing the difficult section for the directors shot. She arrived smiling at the top of the climb and within minutes of me setting up the abseil rope she was off down the rope, pausing only for the cameraman. "Thats a rap" I said as Sally reached the bottom of the crag. I've always wanted to say that, I think it went over the crews head, a rap or rappel is an american term for an abseil. The whole thing was done in a couple of hours, she is a very pleasant professional lady. A number of people and visitors stopped to talk to Sally and even though she was on a very tight schedule she stopped, smiled and chatted. We all had lunch at the Wasdale Head Inn with Howard and spent a very pleasant hour chatting about the mornings adventures. 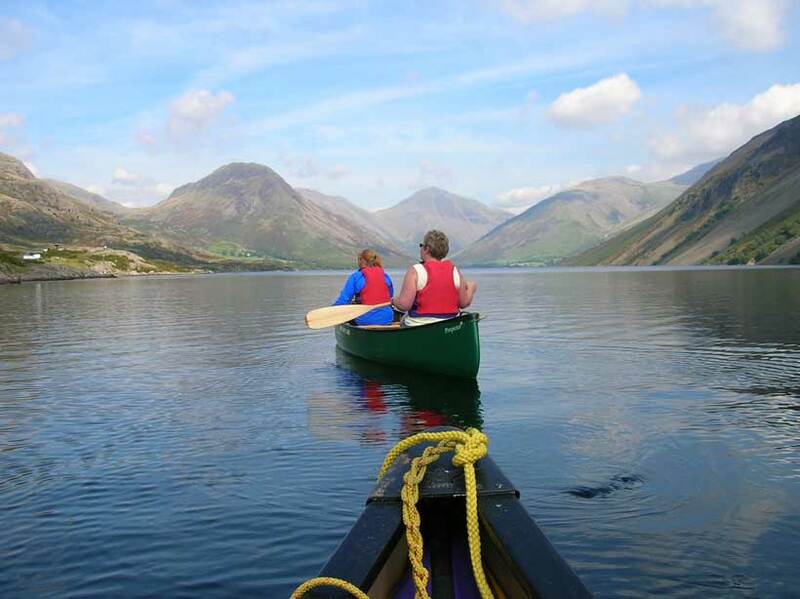 Below are a few pictures of other clients enjoying Wasdale and "Britain's Favorite View".